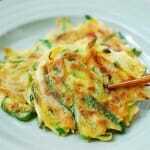 Pajeon is a Korean savory pancake made with scallions. 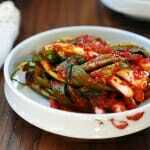 Pa means scallion, and jeon means pan-fried battered food. 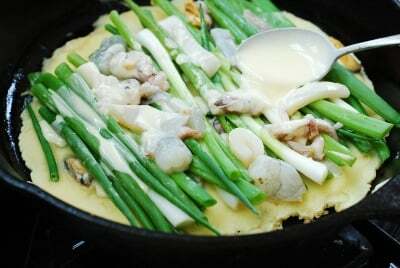 A popular variation of pajeon is haemul pajeon, which is made with seafood. 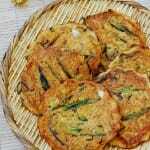 Pajeon is one of Koreans’ all-time favorite snacks or appetizers to share when gathered around the table with friends and family. Everyone always loves it! Commercially available pancake mix (buchim garu, 부침가루) is a pantry staple in Korean homes. It is seasoned and typically includes flour and other ingredients such as corn starch, rice flour and baking powder for a crispy texture. Sometimes, Korean home cooks combine pancake mix with frying mix (twuigim garu, 튀김가루) for extra crispy pancakes. Try it if you have a bag of frying mix, using a 1:1 ratio. However, you can easily make pancake mix from scratch at home. Starting with flour, simply add rice flour and/or corn starch along with a little bit of baking powder if you have any. Add some minced garlic and ginger (or powder), and season with salt. 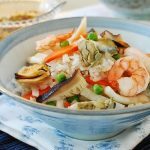 Usually, a combination of seafood, such as squid, shrimp, mussels, oysters and clams, is used, but you can simply use any one (or two) of them. There are different ways to pan fry scallion pancakes. Sometimes, I combine everything together in the mix before pan-frying. Other times, I only mix the seafood in the batter and then later add the scallions on top when frying. 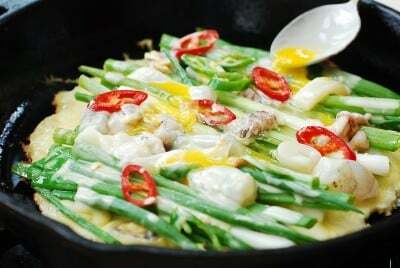 Some people put the scallions first in the pan to crisp up and then spread the batter and the seafood on top. Try these different techniques and see which one you like. 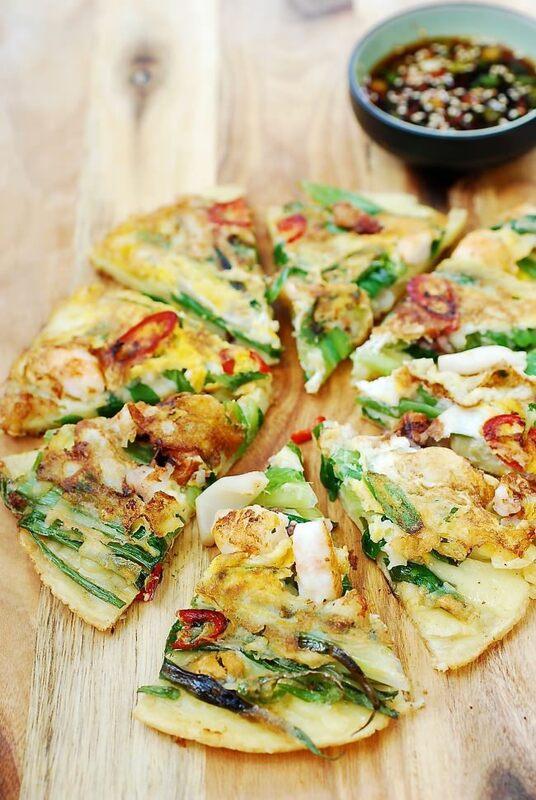 The biggest question everyone asks is how to make pajeon extra crispy. There are a few things you should remember. We already talked about the addition of corn starch and/or rice powder. You should also use icy cold water to make the batter. Use a generous amount of oil, and turn the heat up a little to finish it up. 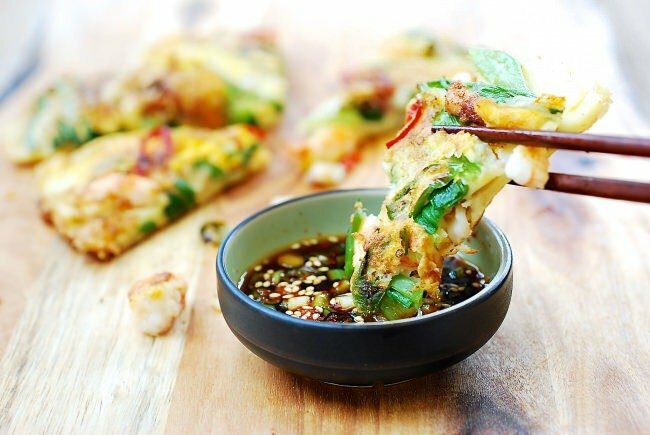 Haemul pajeon - crispy delicious Korean scallion pancakes with seafood! Prepare the seafood, scallions, and optional peppers, draining the excess water. 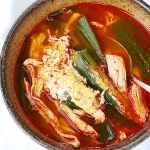 (Wet ingredients will make pajeon soggy.) 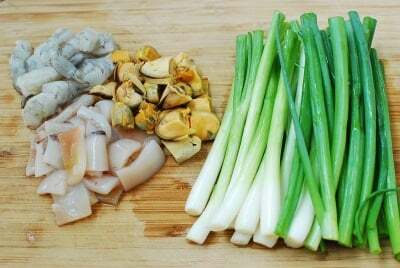 Mix the seafood with the sesame oil. In a large bowl, mix the pancake mix with 3/4 cup icy cold water and the egg. Add a little more water until the batter is slightly thick but still runny. 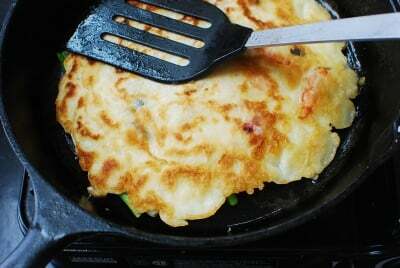 (For crispy pajeon, the batter should be relatively thin.) 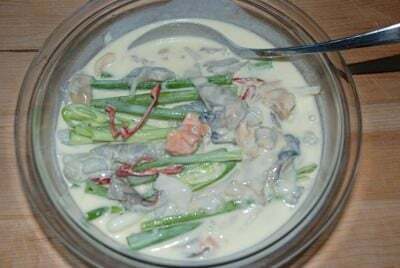 Mix in 2/3 of the seafood. Heat 2 to 3 tablespoons of vegetable oil in a non-stick pan over medium heat, ladle 1/2 of the mixture into the pan and spread it evenly into a thin round shape. 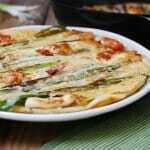 Arrange the scallions in a single layer on top of the batter, and add 1/2 of the remaining seafood and a few slices of the optional peppers. Spoon one half of the optional lightly beaten egg on top. Cook until the bottom is golden brown (3 – 4 minutes), and turn it over, adding more oil (2 to 3 tablespoons). Turn up the heat briefly to medium high to crisp up the pancakes. Press it down with a spatula, and cook for another 3 – 4 minutes. Repeat the process with the remaining batter and ingredients. Serve hot off the pan with dipping sauce. You can mix everything with the batter and follow the direction above for pan-frying. I love this dish. As a variation, I have made it with clams only, since I live in New England and clams are cheap and delicious here at a dollar a pound. 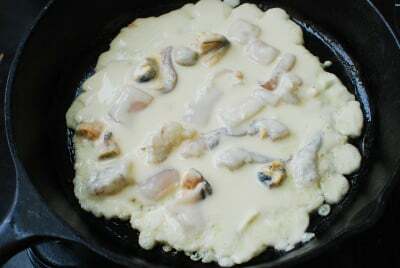 I use the juice from the clams in place of the water in the batter. Sounds delicious! Thanks for letting me know. My jeon did not come out very crispy and I think it’s because I used too much batter for each one. Can you tell me how many pancakes you usually get out this recipe? Thanks. Also, I love your site. It could have been too thick. Also, using a bit more oil and higher heat will help if you like it very crispy. I don’t remember how many, but I’ll count them and update the post next time I make this. Thanks! Thank you for the quick response! I’m looking forward to trying again. You don’t need to. Garlic and ginger will add extra flavors, but buchim garu is usually seasoned pretty well. Enjoy! Thank you for posting this. Buchim garu isn’t available everywhere; your recipe looks like a good substitute. Every other recipe for jeon I found online either calls for buchim garu or just flour, which obviously would be missing something. You’re welcome. Try it and let me know how you like it. Thanks! Thanks for stopping by and for the nice words! Made this for our family’s New Years Eve bash… It was a big hit. Thanks for sharing! That’s great to hear! Happy New Year! Thank you for recipe^^. It turned out great^^. Nice! Thank you for letting me know. is it the same as rice flour? yeah they are the same. Thanks! Hi Russ – Thank you for the nice words! That’s awesome you make Korean food for your family! 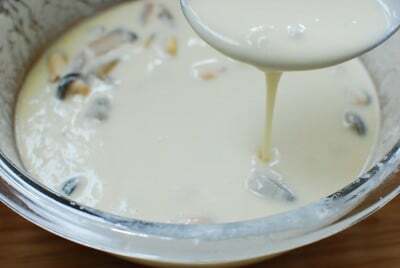 There are various ways to make it, but basically you will need to soak the dried squid for several hours until softened, and then chop into small pieces to mix with the batter and other ingredients of your choice. Hope this helps. 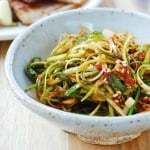 Hi, can i use garlic chives instead of green onion? 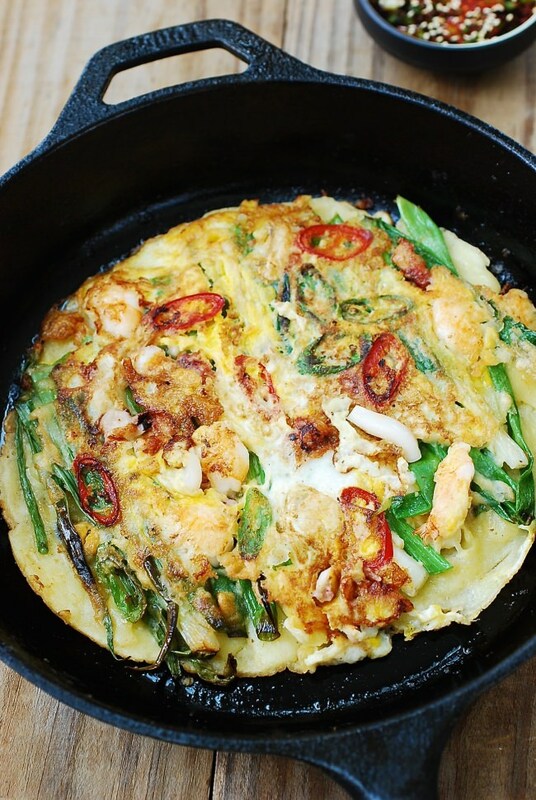 We just had the Korean Seafood Pancake in J-town, San Jose and are thrilled to find this recipe. I thought ours had rice flour in the recipe and am happy to find this one instead of others that called for wheat flour only. I’m glad to hear you’re going to try making it at home. Enjoy! do you find using cast iron creating a better quality pancake? more oil compared to non stick? which kind would you recommend? non stick or cast iron? Use cast iron if you have it, but I wouldn’t go out buy one just for this. Thank you for sharing the recipe. I made it for dinner just now and it was a success; crispy and delicious! I will make it again soon, for sure. I also made the dipping sauce. I will check out your other recipes. Thank you so much for pointing at option of mixing everything! I love Korean food, but most instructions for cooking this pancakes for not very experienced cook. I plan to make those tonight, plus check, if they can be reheated tomorrow. Is it acceptable to serve pajeon with Korean BBQ? Of course! It will make a great appetizer. 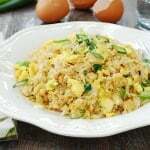 Enjoyed this recipe’s simplicity and flexibility. I used a seafood mix I had on hand and roughly measured the dry ingredients for the batter. I had not thought of using sweet rice flour and cornstarch. It worked out well. For other home cooks, I will note that I had to use about double the recommended water to get the thin consistency needed. Glad you liked the recipe! Thanks for the feedback on the sauce! I will add a note.